Working two cases—looking into a murder for the NYPD, and a rich man's break-in—should be well within our abilities. But when things start getting weird in the Electric Apple, Private Unaffiliated Paranormal Investigations is stretched to the limits, trying to keep one step ahead and out of trouble. Add in rumors of a powerful creature gunning for us and it's not just our rep on the line this time—if we don't solve this case, everyone will suffer. Fortunately, around here, when the going gets weird, the weird hire us. This is a series that I stumbled onto and one that I am definitely going to follow in the future as well as picking up her back list. 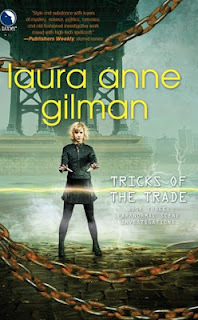 I was really impressed at how well TRICKS OF THE TRADE stands on its own even though it is the third book in the series. I think that what really set this book apart in my mind is the way Ms. Gilman explains the group dynamic of the PUPS as a pack. There are the Big Dogs which as the bosses and then the working team with the alpha dogs and all. The working team is really trained to work together as a pack and it is a dream to see. Ms. Gilman has also done a wonderful job with her characters. Even though it is set as a first person thru both Ben’s & Bonnie’s eyes, we really get to know all of the characters. And even though Bonnie is definitely the primary in the story, there really aren’t any secondary characters as all of the pack play such an important part in the story. This book had me enthralled from the very first page and I do recommend it to anyone that enjoys urban fantasy. I rate this book a 4.5. 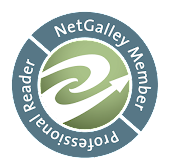 ***I received this book at no charge from NetGalley in exchange for a fair and honest review.